The State Fair of Texas is back! The event that Texans and those across the United States wait for every year is one of the best celebrations of Texas pride that attracts people from all over the country. 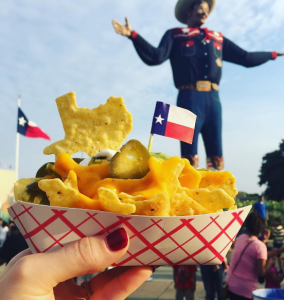 Much of what makes the State Fair memorable year round is iconic Big Tex, the outrageous and delicious food you won’t find at just any state fair, and the Texas Star Ferris wheel. With so many historical and uniquely Texan things at the State Fair, navigating and planning your day can be hectic. Luckily, you can make the first stop at the West End in downtown Dallas your first destination of the day! The West End features local shops and restaurants for your before or after adventure at the State Fair, as well as plentiful parking lots and garages that will save you time, money, and give you the chance to take the DART train from the West End station to Fair Park and back. For those who are traveling out of town, the West End also hosts several hotels for your stay – you’ll truly find everything you need to make your State Fair trip complete! While we love being Texans and residents of the beautiful historic West End, we love to share our pride, as well. 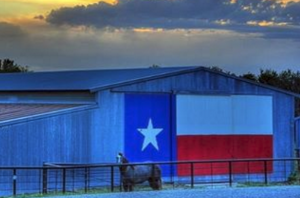 Here are our favorites and “must sees” of the State Fair of Texas! The theme of this years State Fair is “Celebrating Texas Agriculture”, giving guests a unique way to experience every aspect of Texas culture, all in one place. The significance of farming and ranching in Texas’ past, present and future, the Fair continues to promote agricultural growth. From the interactive exhibits explaining how Texas agriculture touches our everyday lives and how food gets from farm to table, to the variety of competitive livestock events and leadership contests for youth, the Fair encourages all visitors to learn more about Texas agriculture. As a whole, the Fair this year will focus on educating guests from near and far about all the ways agriculture impacts the community, as well as our day-to-day routines. Dallas West End: Did We Mention Food? Oh yes, the food – one of the biggest highlights and draws every year to the State Fair. Locals will tell you to plan just a day for the food, from cooking competitions to wine tastings to samplings from vendors far and wide to right inside Dallas. 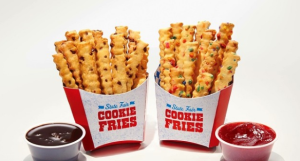 It’s not the fair without the Big Tex Choice Awards, with winners such as Fried Jell-O and State Fair Cookie Fries (crinkle-cut fries that are covered in chocolate and sprinkles). 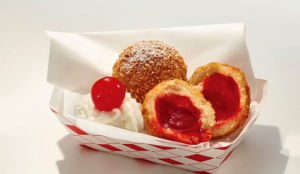 Tasting these treats along with the dozens of other fried concoctions should be on the top of your Texas State Fair checklist. If you are not full of fair food, or simply wanting a pre-or-post meal, the West End has you covered! From our uniquely Texan steakhouses like Y.O. Ranch Steakhouse and Hoffbrau Steaks, to Ellen’s Southern Kitchen and Gators, whatever you are craving can be found right around the corner from Fair Park. Enjoy all the West End has to offer, from shopping to restaurants, to make your experience of downtown Dallas complete! A trip to the fair is more than just fun and games, it gives everyone in the family a chance to learn more about the city, state and world in which we live. The anticipated return of the Budweiser Clydesdales will be around for all 24 days of the fair, allowing guests to learn more about these horses and learn the history of the Clydesdales and their role as ambassadors for Anheuser-Busch. The Texas Exhibits in the Hall of State give a flash history lesson of the Lone Star State, with the “Six Nations Over Texas”, the “Ways of the West”, and traditional cowboy lifestyle at “Vaquero: Genesis of the Texas Cowboy.” The Texas Discovery Garden is a great place for rest and relaxation at the fair, featuring local organic gardens and a tropical butterfly house. It doesn’t end there! The historic West End in the heart of downtown Dallas gives patrons the most exclusive and best view of the city. From dining, shopping, free parking and hotels in downtown Dallas and the West End, your stay will be complete and truly, uniquely Texan the moment you arrive. 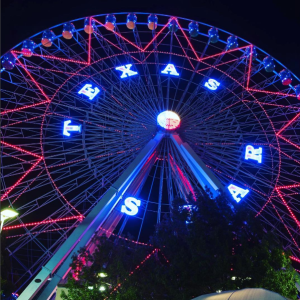 The West End is the premiere spot in downtown Dallas for everything you need to make your visit to the State Fair of Texas complete. Whether you are a visitor or a native Texan, exploring all the parts of what makes Texas the best state starts here in the heart of downtown Dallas. The West End looks forward to seeing all the pride Texas has to give at this years fair!